Since then, not only is Mulumba making a living a football player in the highest league possible, the National Football League, he is a part of one of the greatest football franchises ever in the Green Bay Packers. This past weekend, he wished to share his experiences with young players who wish to follow in his footsteps. The linebacker spoke to young football players at Concordia’s Oscar Peterson Hall this past Saturday night as part of the first ever Andy Mulumba – MTL conference. The goal of the conference, led by the former Cegep du Vieux-Montreal Spartiates player, was to uplift and improve young aspiring football players from Quebec. 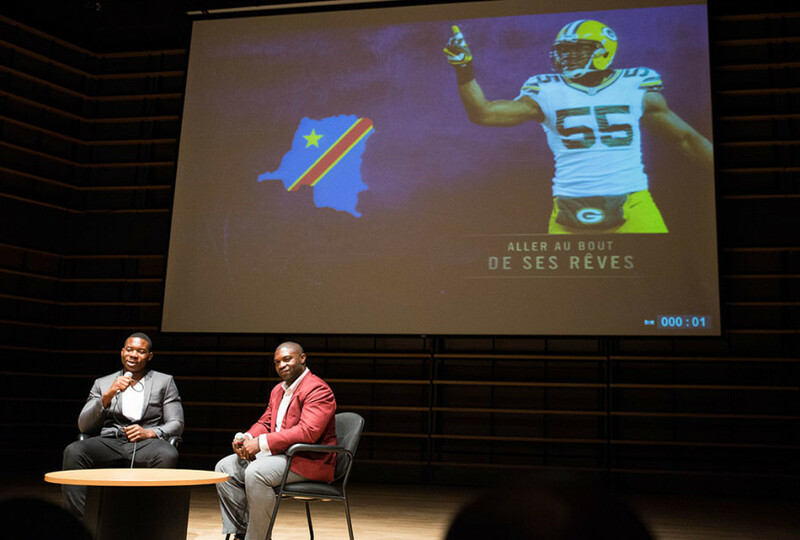 In front of family, friends and young football players, Mulumba told his personal story, emigrating to Montreal from his native Congo at the age of nine all the way to playing professional football at Lambeau Field for the Packers of the NFL. Hard work and education were among the main themes discussed by Mulumba during the evening. The linebacker had to add to his academic workload at CEGEP Vieux-Montreal, taking nine classes for each semester in order to graduate after two years. Mulumba also discussed the struggles of having to take SATs in order to get accepted at Eastern Michigan University in the United States. This difficult second year of CEGEP got tougher when Mulumba’s father found a job in Gatineau, forcing his family to move from Montreal. However, with an overstocked school year ahead and an understocked bank account, Andy decided to not join his family to Gatineau in the hopes of obtaining a scholarship in the United States. After four years of playing in the NCAA with the Eastern Michigan Eagles, including being named to his conference’s All-Academic team three times, Mulumba was on the verge of playing professionally. The option of playing in the Canadian Football League was there, but he also drew interest from NFL teams. Despite being undrafted following the 2013 NFL Draft, Mulumba was given a tryout by the Packers. After the obvious joy felt by him and his family, he realized making the team was not going to be easy. Mulumba’s hard work in limited time payed off as he took advantage of injuries in the lineup to earn a spot in the Packers lineup. He was productive in his first year, but tore his anterior cruciate ligament in his right knee two games into his second season. “I learned [through my rehabilitation] that it can happen to anyone. Of course I was depressed, I asked myself why it happened to me but I put so much effort in order to come back as strong as possible [in those ten months], Mulumba said. Mulumba’s journey has now brought him to the final year of his three-year deal with the Packers. The linebacker knows he needs to work hard to regain his spot in the starting lineup, however, he won’t let his current contract situation worry him.